Gifts from the Pirates: "Christmas is, of course, the time to be home - in heart as well as body." "Christmas is, of course, the time to be home - in heart as well as body." Since taking Opeie out of nursery last year , he has refered to our afternoons together while Mrs M is at work and Seth is at school as 'Daddy nursery', which i love. Ive noticed over the last few months though when Opeie has mentioned the term, Seth has looked a little down, almost like he feels he is missing out on some of the fun that we have. A few days back i could hear the boys in their room and Seth was asking Opeie what we do at Daddy nursery. After Opeie excitedly listed off some of the activities we have done recently, Seth came downstairs and asked "can we do a Daddy nursery activity today please?". 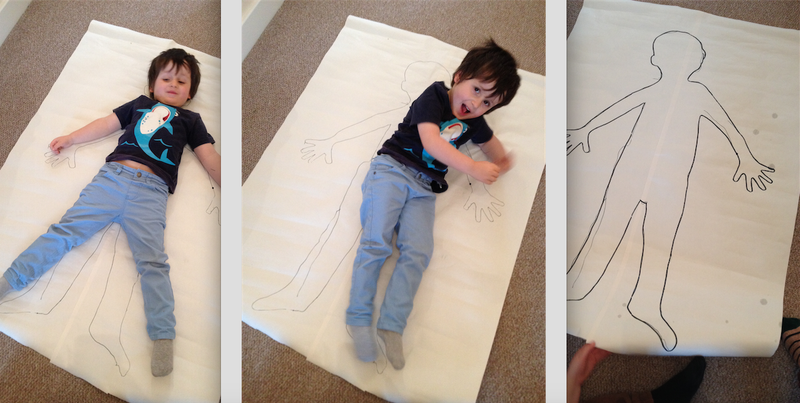 I thought it would be interesting to get the boys to draw internal body parts. I wanted to see what shape they thought the parts were and the size using Opeie's body outline. Most importantly though i wanted to see where they thought these body parts were located and what they thought their purpose was. I knew that Seth knew this but i was using it as a 'Seth teaches Opeie' activity without him realising as Opeie really takes in everything his big brother tells him. Seth was very much 'this is what it looks like and this is what it does!' obviously the things he has been learning at school have stuck. As expected his drawings were excellent and it was interesting to learn from Seth. He thought we had one very large lung for the "good stuff we breath in" and a small lung for the "bad stuff we breath out". Also the large and small intestine are virtually the same size. He had no idea what shape the kidneys were but based his drawing around kidney beans which was awesome. Seth also showed an interest in drawing testicles? ?, which looked like grapes on a thin string, not bad i thought. Opeie, having very little knowledge of internal body parts was a little more creative with his drawings and descriptions. The stomach (i was informed) has eyes and a mouth, it smiles when it eats nice things like Broccoli and Chocolate but it has a sad face when it eats meat (I'm sure that will make Mrs M smile when she reads this). I also found out that we in fact have three lungs that are all stuck together, kidneys look like donuts and both intestines look like spears. It was cute to see that the heart was 'heart shaped' to Opeie but Seth had drawn a more detailed version of our very important muscular organ. There were other parts i wanted us to go through but the boys were eager to put their sketches on Opeie's drawn outline out in the hall. We placed the brains on first and when Opeie put his just above where the stomach should be i knew it was going to be interesting. The human stomach is usually located in the head! or so Opeie says. Seems a long way down for evacuation after your food has been processed in the torso area and sent back up. This may have been placed here though because of the smiley face (it did look cute). Polly as always came to get involved and was happy plonking herself down in the middle of what we were doing (i wonder if we could do a similar activity with a cat shape?). Intestines in the legs and kidneys in the hips and wrists, it was turning out to be a very fun activity. They both knew exactly where the testicles were located (no surprise there though, remember the planetarium post?). The activity is a two parter, the next part being me drawing the correct shape/size of the parts and showing where they are located. Seth did an excellent job of explaining to Opeie the purpose of each part drawn, all except the kidneys as he wasn't sure. Seth wants us to draw around him next so I'm thinking we do a similar activity to talk about bones as Opeie is always talking about skeletons and skulls. Our afternoon of learning gave me a great idea for Opeie's home teaching and something that Seth can be involved with regularly too. A fun afternoon was had by all at Daddy Nursery and clearly Seth loved being a part of it and of course we loved him being there.